My name is Craig Cazier and I have been sharpening for more than 16 years. I am an NBTSG (National Beauty Tool Sharpeners Guild) Certified Grand Master Sharpener. By virtue of my Master Sharpener status I was asked to judge at the new IBSA (International Beauty Sharpeners Association) certification test. This honor means that having judged at the NSSG, the NBTSG, and the new ISBA I am the ONLY person ever to have judged at all three of these certification events. 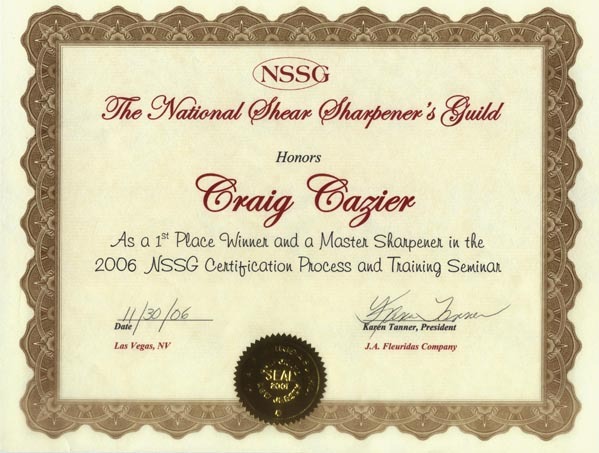 I am an NSSG (National Shear Sharpeners Guild) Certified Master Sharpener. YES, I CAN SHARPEN YOUR EXPENSIVE JAPANESE HONED SHEARS! We service the Idaho Falls, Blackfoot, Idaho area and gladly accept Mail Orders from anywhere. Click on the Price & Shipping Links at the left for pricing and shipping information. I have been factory trained at the Arius Eickert scissor factory in Fremont Ohio using factory approved equipment and I do continuing education in the form of training seminars and trade shows. I continue to attend these seminars and trade shows to include at least two a year. In 2006 I certified as Master Sharpener with the highest score achieved that year. In 2007 & 2008 I was asked to speak and judge the NSSG certification test along with several other nationally recognized sharpeners and trainers. I have been authorized by several scissor manufacturers to sharpen their shears without voiding the warrantee; these include Arius Eickert, Chris Christensen systems, Elite Products, and SharkFin Shears. I am a member of the Oster Sharpeners Advisory Board helping Oster retain world leadership as a provider of professional products. I have been certified as a Grand Master Sharpener with the NBTSG National Beauty Tool Sharpeners Guild. I was also asked to participate in the NBTSG as a speaker and certification judge at their first convention in late August 2009 and also in 2010, 2011, & 2012. At the 2013 convention I was voted to the Board of Directors as the Director of the "Master Sharpener Advisory Committee". The NBTSG (Click on this link to go to the NBTSG web site) is an organization that instructs, tests and certifies the sharpening skills of sharpeners who sharpen all types of beauty & grooming tools. Certification will include Scissors / Thinners as one test and Clipper Blades as another test. Certifying as a Master Sharpener in both Scissors / Thinners and Clipper Blades is required to become a Grand Master Sharpener. Certification for nail nippers & other tools associated with the beauty and/or grooming industry may be added at a later date. I have trained at the Arius Eickert Scissor Factory in Fremont, Ohio and I have a training Certificate from Arius Eickert (this is the same system they use at the factory to sharpen new shears). I also have a training Certificate from Wolff Industries for their “Twice As Sharp” and “Ookami Gold” sharpening systems. I am an "Oster Authorized Sharpener" and all clipper blade sharpening is done on a precision hollow-grind machine that duplicates the same sharpening pattern as the factory. I keep abreast of the latest in equipment and technology by regularly attending sharpening shows, seminars, and factory training. We sell Top Quality Shears by Shark Fin, Kenchii, Kasho, Arius Eickert, Bonica, Ookami, Subi Cut,Tenyo, Washi, Buttercut (Geib), Rose Line, and others. We also sell Andis and Oster clippers, trimmers, and blades. We sell the new and exciting “Twis-Les” cord covers that help prevent your cords from becoming twisted and tangled. Available in a variety of colors.